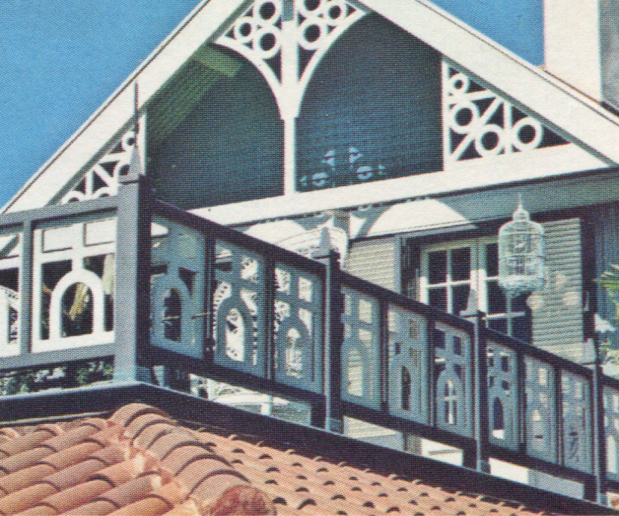 From 1971 to 1994, the Adventureland Veranda sat at the entrance to Magic Kingdom's Adventureland and welcomed travelers with airy open porches, dark burnished wood interiors, lazily turning fans, and a healthy serving of mellow exotica music. For nearly a quarter century this mysterious mood and mellow tone rolled out across the entrance to Adventureland, creating a very different mood than what welcomes you to the area today. And the music was essential in setting the scene. Now, after several years of chasing down Jack Wagner's music selections, I believe I've come to know that there were two Jack Wagners: the innovative, dedicated Jack and the Jack who was more willing to slap together any old appropriate music. Certain styles of music seem to have ennervated him more than others, and it seems to me that he truly found his raison d'être when compiling music for Adventureland. No mere aural wallpaper, many of these loops are carefully considered masterpieces. One myth that seems to dog Wagner is that he put together his musical loops from records he had sitting around his house, and although he was a former DJ and so almost certainly had more than a healthy amount of music, this idea is absurd. Looking at the track listings for things like Holiday in Switzerland it's easy to imagine Jack plodding back off to the record shop in hopes of finding just one more LP of Swiss Music, because Music of the German Alps was a bust. 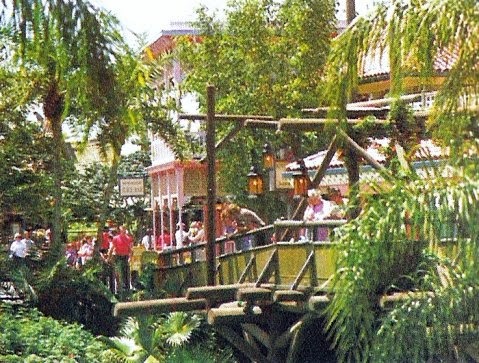 But I completely believe the story when it comes to the Adventureland tracks. Jack seems to have loved exotica music, and once you start identifying and decoding the tracks, you start seeing the same music popping up again and again. And guess what? He had terrific taste for the stuff. Eventually, you can assemble the "Wagner Exoticas" into an impressive collection of your own. 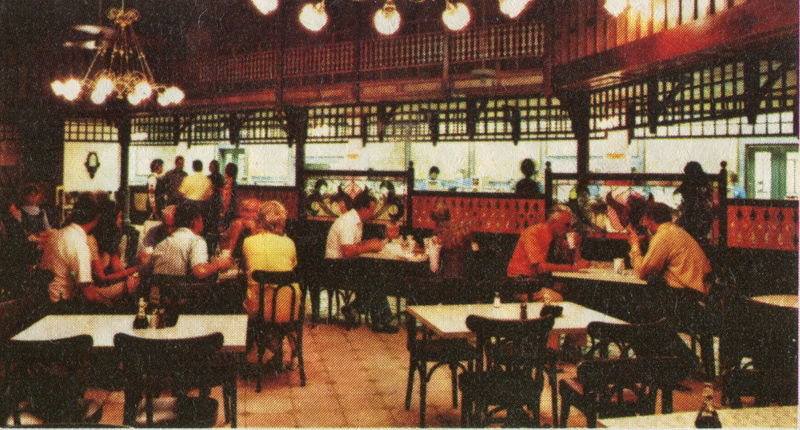 The main interior section of the restaurant where the service counter, cashier, condiments and some tables were located was a large semi-circular room denoted here by the yellow section. The bulk of this room survives intact and may be seen by eating at the Skipper Canteen restaurant that fills this space. The below photo shows this interior "donut" with the brightly-illuminated service area behind it. The final blue section on our diagram which rambled out towards the breezeway is the only part of the original Veranda to not survive until the present day; it was absorbed by an expansion of the public bathrooms in 2009. This was the furthest-flung seating and the tables and chairs were still there until 2009. For several years now, an hour long loop of music identified as "Adventureland Veranda 1973" has been circulating in a new digital dub of an old tape circulated amongst collectors. I'm not only pretty certain this is authentic, I also believe that it is the original 1971 music. It also, to me, represents Jack Wagner's unique genius for background music. It's worth remembering that Wagner was working on the original slate of 1971 Magic Kingdom loops blind - there was no park to go to to observe in situ, and his probable one trip to WED up in Glendale was full of art that may or may not have been translated into reality. It's worth remembering that WED themselves often described the Veranda's exact theme in uncertain terms. 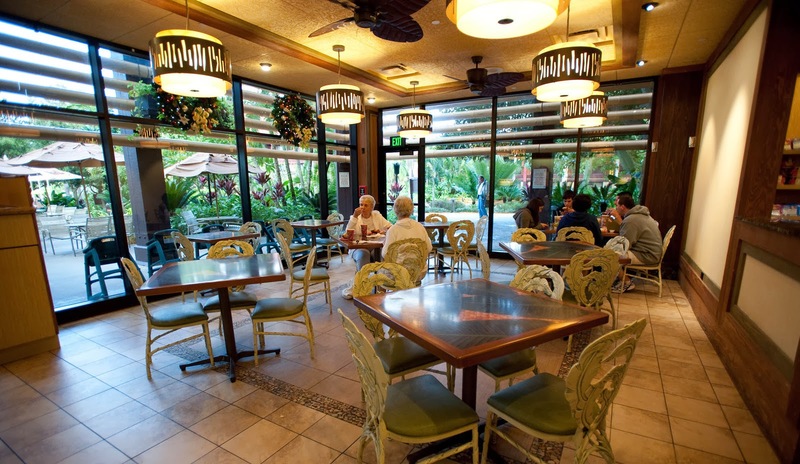 The Preview Edition Guide describes the Veranda as an "old Caribbean village setting", while a blurb in the Orlando Sentinel describes it as "south seas food in a Tahitian setting". 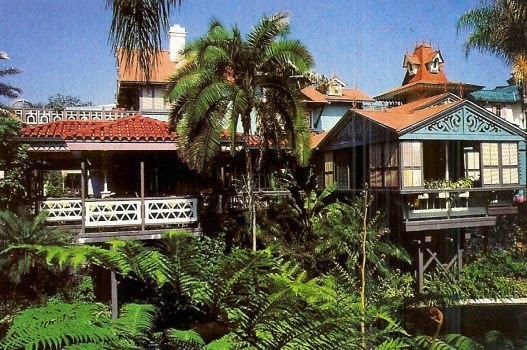 I have an entire blog post devoted to the reason why the restaurant is designed the way it is, but the short version is that it represents a South Pacific French Colonial plantation house. The core of the loop is an astonishingly obscure recording, Toragee by Leopoldo Silos, a Filipino composer. Toragee highlights music from China, Japan, Korea, the Philippines, Malaysia, and Thailand. 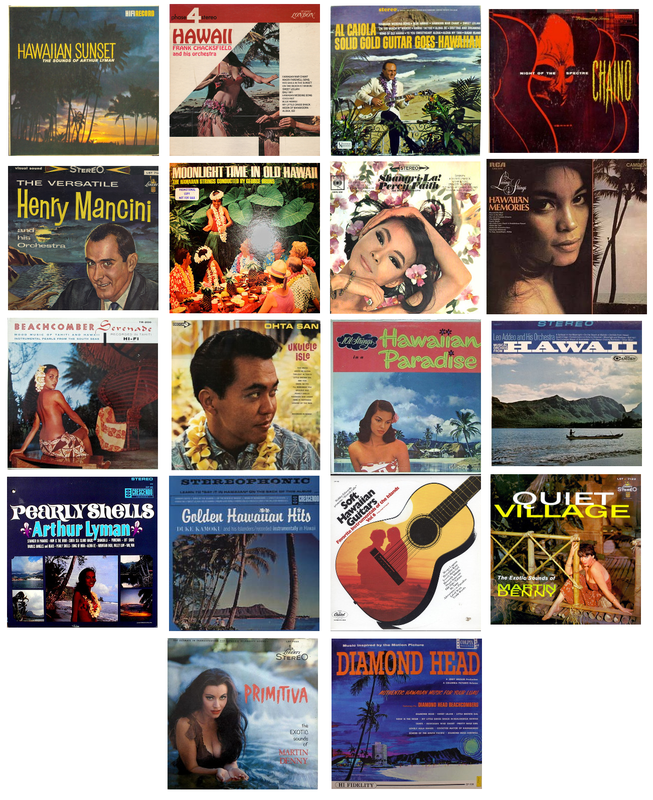 To this, Jack Wagner added Hawaii and folk recordings from China and Tahiti. Percy Faith's Shangi-La! provided a sweeping start and finish to the record, Cherry Blossom representing Japan and Mountain High, Valley Low for China. Bu far the most obtuse record on this list is "Beautiful Japanese Melodies - Mood In Bossa Nova", which was released by Columbia only in Japan and features an LP sleeve with nary of fleck of English on it. How a copy of this ended up in Los Angeles in order to be picked up by Jack on a record expedition is unknown, and then how it wound its way through a theme park area loop, into the hands of collectors, then back onto the internet to be discovered by you is even less likely. Personally, I'd be very interested to know if Jack began with Toragee or if he began with Shangi-La! as the basis for the loop. They're both conceptually very similar albums, being tours of the Asian Pacific cultures in a lush, easy listening style. This dedication to mixing actual Asian melodies with world music recordings is fascinating and shows real commitment to both his concept and the actual theme of the restaurant. Interestingly, this hour-long loop seems to only be half the story - it represents what played in the interior of the restaurant. The exterior seating areas had an entirely different loop! I was first made aware of this by Mike Cozart, who reported the existence of another hour-long loop associated with the Veranda which featured entirely different music selections with the sound of exotic bird calls mixed over the music. Without much to go on for this lead, I filed that away in the back of my head until last year, when I was combing through live audio recordings from 1983 sent to me by blog reader Dave McCormick. Several times during his trip, Dave and his friend stopped to sit at those verandas facing the Magic Kingdom hub, and faintly behind their conversation could be heard unfamiliar exotic music with bird calls mixed on top! Although two loops for one restaurant seems extravagant - one inside and a different one outside - it is consistent with my finding about the early Wagner loops, which suggest that the Magic Kingdom originally had more unique loops in more places than was strictly necessary, and that over the years these loops were often retired or combined with others. 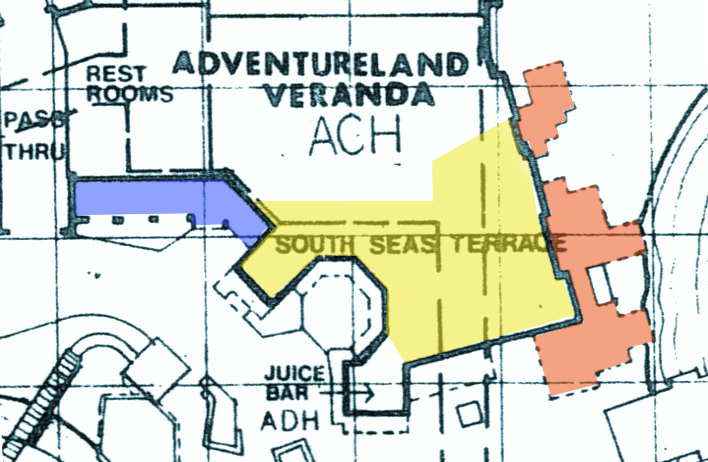 Interestingly, at some point it seems that the original Adventureland Veranda Interior loop was replaced with another, although the date is uncertain - Mike Lee at Widen Your World remembers this second loop but not the early Asian-style one, which has led me to think of it as the "Kikkoman Loop". Kikkoman soy sauce signed on as sponsors of the eatery in 1977. Compared to the conceptual and musical unity of the original music loop, this one is much more what you'd expect from BGM in Adventureland: mellow exotica music. It's beautiful, of course, but it's of course both simpler and less throughly unified with Dorothea Redmond's amazing architecture. When the unique original exterior loop vanished is unknown, although thanks to Dave we know it survived at least into 1983. Notes: Playlist based on a 1992 live recording provided by Mike Lee and compiled by wedroy1923. AprilDecember generously provided a rip of Moonlight Time in Old Hawaii on MouseBits, which greatly aided in compiling this playlist. Thanks also go to Kaiwaza on the Tiki Central discussion boards for identifying track #11. I won't post a full loop of this version here due to the fact that the vast majority of this music is already commercially available on iTunes. 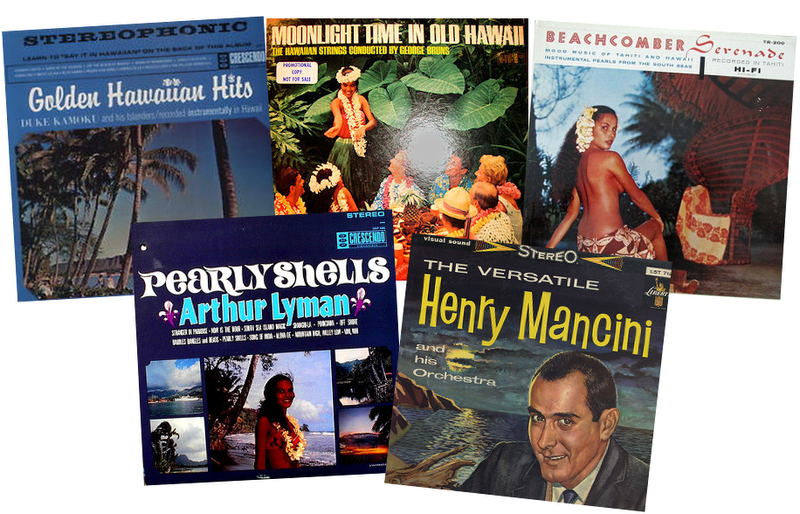 The one album that isn't, George Bruns' amazingly evocative Moonlight Time in Old Hawaii, I have made available here. 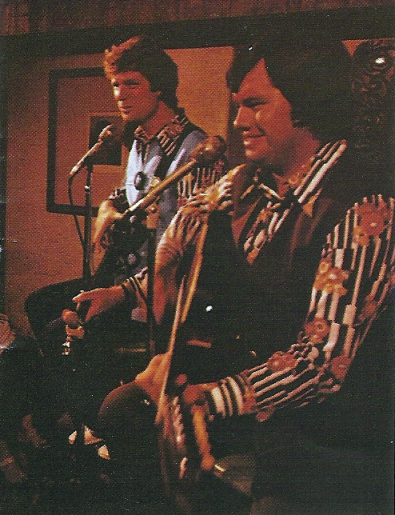 A good quality live recording of the entire 1977 loop may be heard at Widen Your World's Adventureland Veranda resource page here. Both of these loops, and probably the mellow "Exterior" loop that for now remains a mystery, are real corkers, and to me perfectly encapsulate why these early BGM tracks obsess me. The ingenuity of the music selections, the chimes Wagner probably recorded on his porch, the fading, and the sequencing creates room tone which perfectly complements the desired mood. This is where background music, so often just aural wallpaper, edges into the sublime. So head out to the kitchen, whip up a hamburger, top it with Kikkoman teriyaki sauce and a slice of pineapple, then hit play on these exotica tracks and chew slowly - you're in Adventureland now. Ready for more? 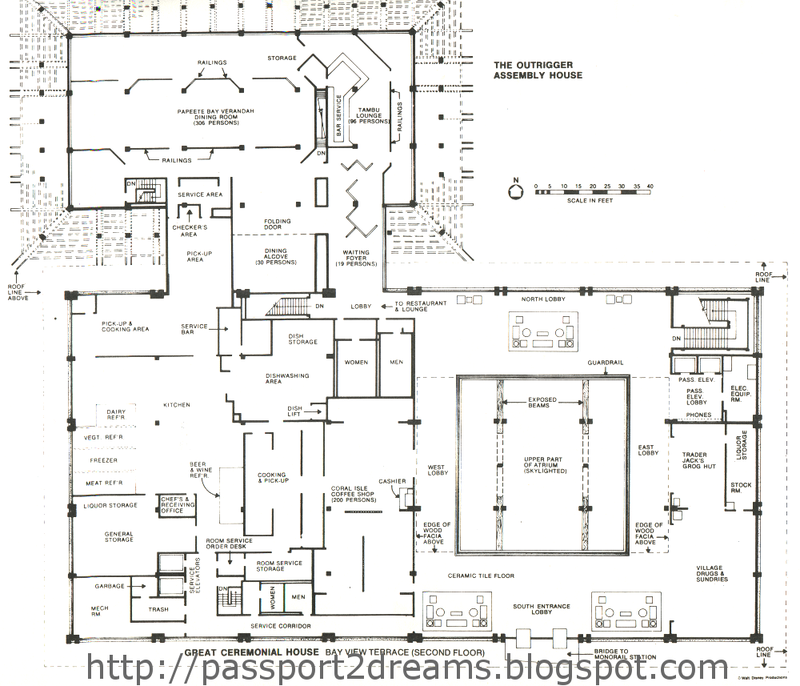 Visit the Passport to Dreams Theme Park Music Hub. Or, hop a monorail to the past and spend a full "day" at the Walt Disney World of the 1970s by downloading Another Musical Souvenir of Walt Disney World. Captain Cook's Hideaway, I thought I was done with you. Back in June 2010, I wrote - and ammended - a series of articles about Captain Cook's Hideaway, the earliest place for Cast Members to drink in the first ten years of Walt Disney World. 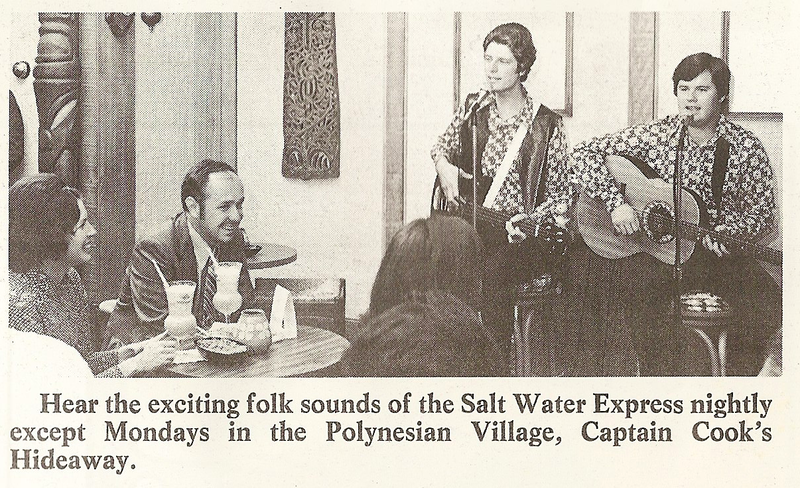 Captain Cook's and especially their in-house band, rock-folkies The Salt Water Express, have since risen to something of a place of prominence in Disney circles, thanks to their goofy look and elusive hit single from 1972, "Can You Arrive Alive on 535?" Footage (and music!) 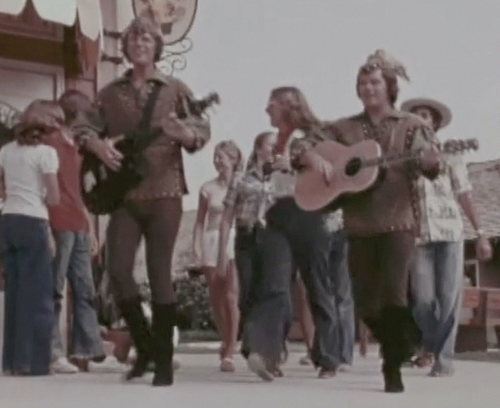 of them even cropped up at the 2011 Destination D event sponsored by D23, where Robert Christopher and Gary Stratton appeared in a mildly traumatic promotional short as pied pipers, leading a group of teenagers on a Magical Mystery Tour to Grad Nite 1975. 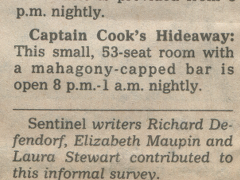 "For guests desirous for a dark rendezvous and the strains of a haunting guitar, Captain Cooks Hideaway provides both, as well as an outside patio romantically bathed in soft candlelight." 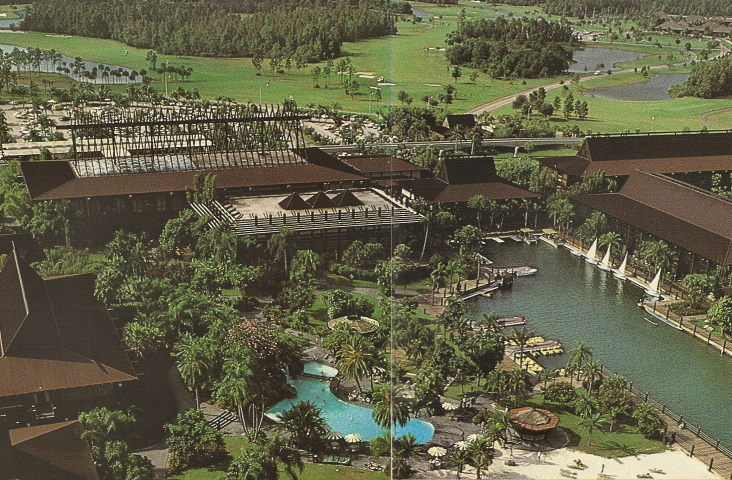 And working backwards from this photo, I identified an aerial view of the Polynesian Village showing where the patio and thus where Captain Cook's was probably located. Which, to me, seems to be pretty solid evidence. Well, in the past few weeks I managed to turn up some interesting primary documents from the Polynesian, one of which was a cast member orientation guide from way back in 1971 - far enough back that it was simply called the "POLYNESIAN HOTEL". But the real discovery here was two pages showing exactly where everything was in the Great Ceremonial House and Outrigger Assembly House in 1971. And - surprise - Captain Cook's Hideaway is in the "wrong" place! The spot I had previously ascribed to Captain Cook's appears to be filled by the "Mickey Mouse Clubhouse", a child care facility. What's most shocking about this is this space still more or less exists - as the seating area to the Polynesian's cafeteria, still called Captain Cook's. Although the original space appears to have been slightly larger to accomodate a bar, it always has been and continues to be a spot with just a handful of tables weirdly crammed inside it. Although I'm delighted to learn that this particular space at the Polynesian seems to have always been a tiny room with tables, I was simply agast that this spot in particular was Captain Cook's. This was the hopping Cast Member after-work hangout where Salt Water Express sang about State Road 535? You could hardly fit three more tables in here. 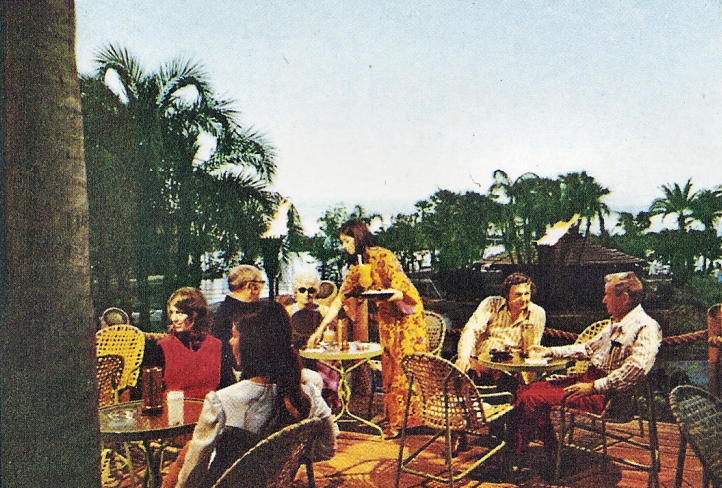 A October 1971 Walt Disney World News also mentions the outdoor patio so there must have been a "spill-over" outdoor section very much like the one that still exists today, only servicing those with alcohol instead of Dole Whips. I went digging back through my files and found that mentions of the "Mickey Mouse Clubhouse" at the Polynesian persist on and off until the mid-70s, when it seems to migrate to the Contemporary Resort Hotel, possibly opening up its original space to an expanded Captain Cook's. 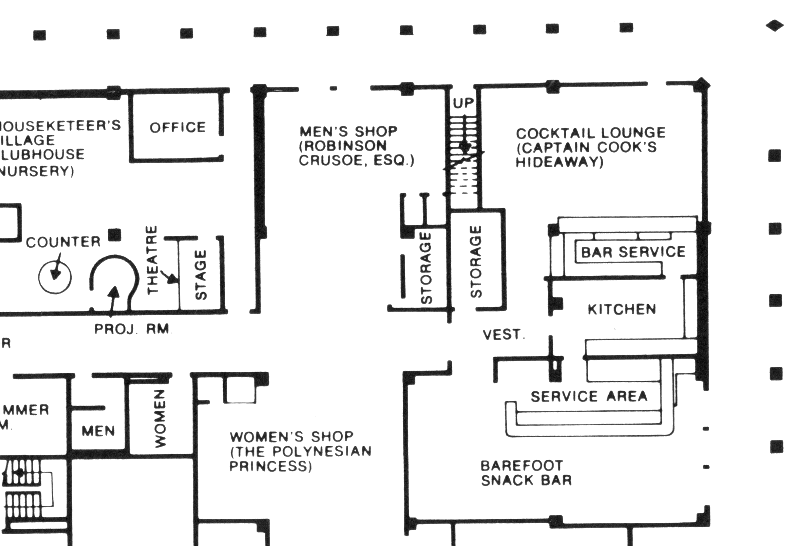 So if Captain Cook's expanded into the old Clubhouse space, then it makes sense that Barefoot Snack Bar would take over the old Captain Cook's space, which is the original arrangement which most of us remember from the late 80s and early 90s. That arrangement still exists today, although the seating area has now taken over the original menswear shop. 53 seats seems like too many for that original 1971 corner location even if they were also counting the patio. 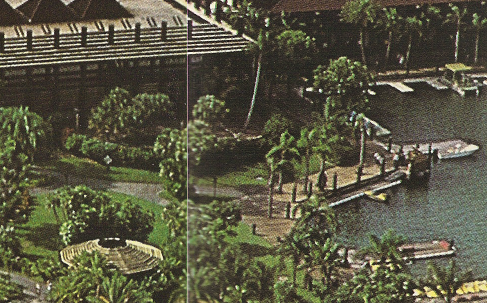 Since the article also mentions the Tangaroa Terrace, the family restaurant built in a custom structure outside the Great Ceremonial House in 1974, 53 seats (about fourteen-seventeen tables) may describe the lounge's second location in the former Clubhouse space. It was such a short lived stint that they may have never played there at all. Disney was advertising their return to the Polynesian Village within a few weeks. 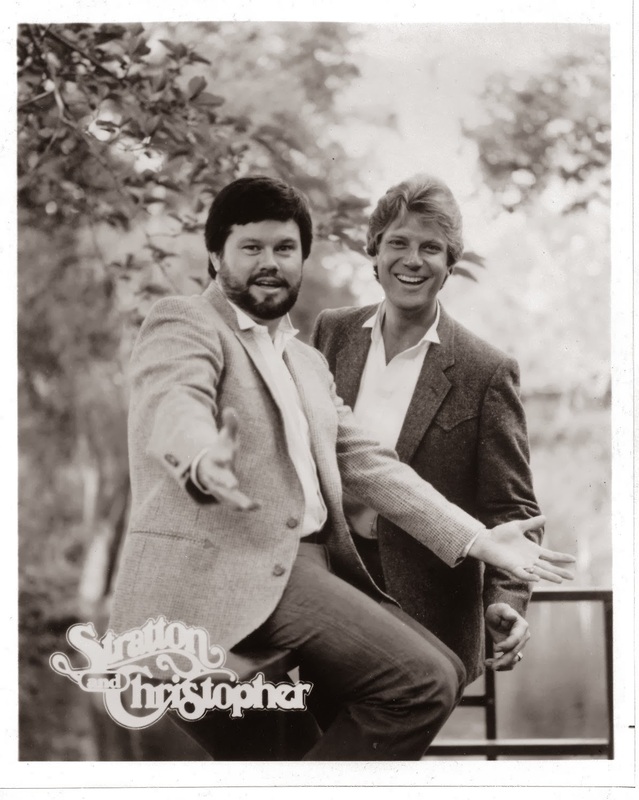 Bob Christopher and Gary Stratton's contract was renegotiated in 1976, at which point they began appearing under the new name "Stratton & Christopher". In-house references to the group (and their popularity) begin to decline from that point onward, and by the late 1970s seem to vanish altogether. 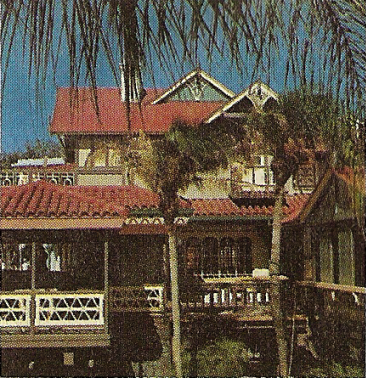 In the early 80s they seem to have moved to a well-reviewed restaurant called Limey Jim's at the US-192 Hilton Resort. They pop up again in California in 1986, filing a trademark on their name and logo which may be viewed here. I haven't been able to find much past that. Besides the few pictures gathered here, no recordings of either Salt Water Express or Stratton & Christopher seem to survive. 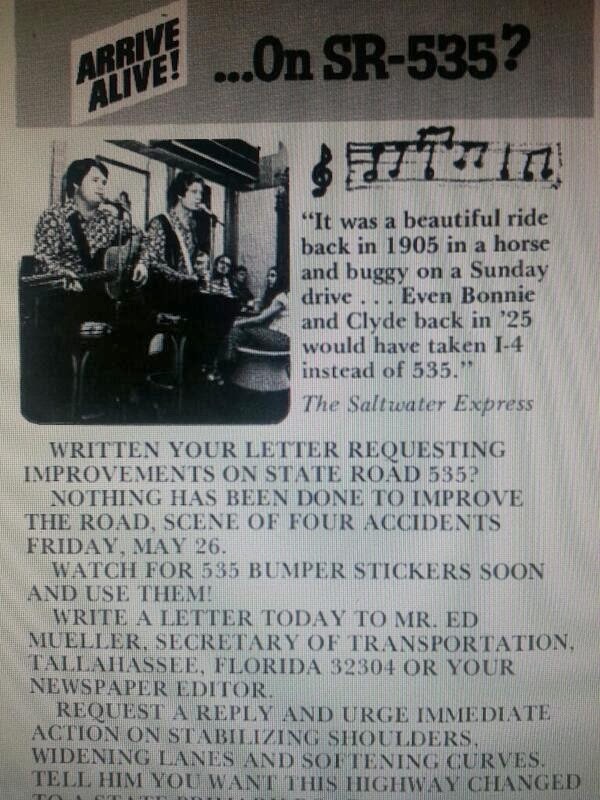 Which is a real shame - I know I'd love to hear "Can You Arrive Alive on 535?" at least once in my life. The Polynesian Resort is now in the process of being dramatically altered - a new wing is going up in what was once open lagoon space, the name is reverting to the Polynesian Village, and sections of the hotel are closing one by one for remodeling. Renewal is a constant cycle of life at the Disney hotels, although none feel as sacred or personal to me as the Polynesian. Since the Tambu Lounge was relocated out to the lobby during the refurbishment which changed the original Papeete Bay Veranda into 'Ohana, maybe this newest refurbishment can bring back more vintage Disney names than just the one for the whole hotel. Too long relegated to an eatery in its former location selling burgers, it may be time to reclaim the name of Captain Cook and attach it to a new Captain Cook's Hideaway, selling stronger stuff than Dole Whips. 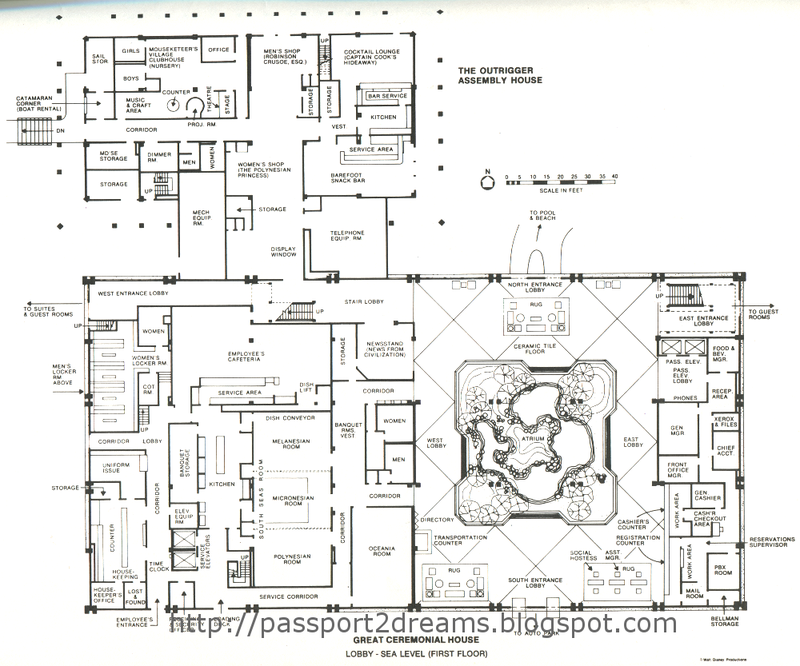 It would be a nice nod to the past in the one Disney hotel which seems most thoroughly drenched in it.